Combine our signature Hollywood celebrity tours with an outing on our Hop On Hop Off bus service and save! Our Red Route Hop On Hop Off and Movie Stars' Homes delivers a day of excitement! 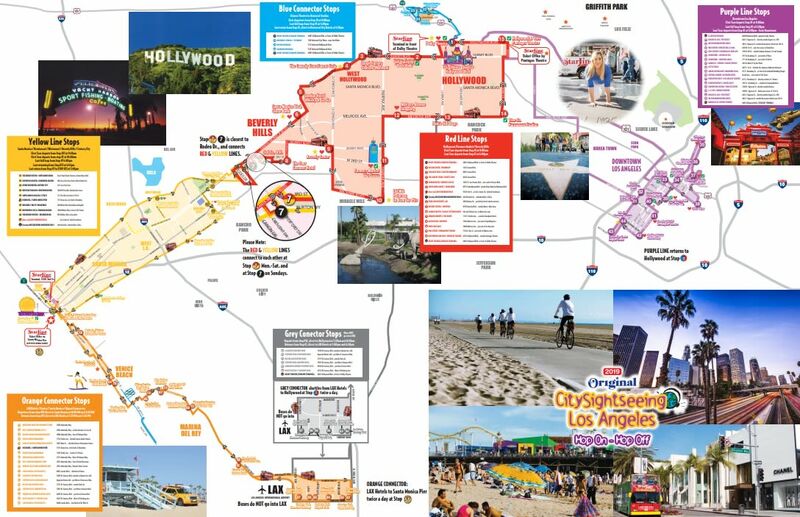 In addition to our world-famous Hollywood celebrity tour, you'll also enjoy access to the Red Route of our famous Hop On Hop Off bus service. Departures every 30 minutes from 9:30 till sun down leaving from the TCL Chinese Theatre at 6925 Hollywood Blvd. Hop off the bus at any of our stops to end your tour. tours return to the TCL Chinese Theatre at 6925 Hollywood Blvd. Catch a taste of the Hollywood celebrity lifestyle as you tour past over 40 celebrity homes in Beverly Hills & the Hollywood Hills. Then hop on and off our open-top double decker buses (with 24-hour or 48-hour ticket options) to explore Los Angeles’ most popular sights including famous attractions, shopping districts & restaurants. In addition to our world-famous Hollywood celebrity tour, you'll also enjoy access to the Red Route of our famous Hop On Hop Off bus service. Buses depart from Hollywood every 30 minutes. Simply hop on board, show your ticket, hop off at any of the attractions along the way and hop back on when you're ready to continue your tour. Pre-recorded commentary is available in 9 languages to help you learn more about the many fascinating sights and points of interest you'll visit. At Starline Tours, our Hop-On Hop-Off double decker buses are your passes to the city, delivering incredible adventure and great value for your money. Board the Red Route to experience the glitz and glamor of Hollywood and Beverly Hills, including such world-famous sights as Rodeo Drive, Sunset Strip, Melrose Avenue shopping district, the Hollywood Walk of Fame, the Dolby Theater and much more. · Melrose Avenue shopping district · ...and much more! You'll save big by combining these two popular tours together for one low price! To learn more, or for help completing your booking, please call Starline Tours at 1-800-959-3131 or (+1) 323-463-3333. Starline Tours has been the leading name in Hollywood celebrity tours for more than 80 years. With a storied history dating back to 1935, Starline Tours is the original provider of Hollywood celebrity tours. Because we've been around for so long, and because we're the best at what we do, we have access to exclusive neighborhoods and districts where other tours are not allowed to go. For an in-depth Hollywood celebrity sightseeing experience that delivers thrills and excitement, the fun starts here! Our Movie Stars' Homes tour continues to be one of our most popular outings. During your trip aboard our custom-built 13-passenger tour vans, you'll visit more than 40 celebrity homes, including some of the most famous and iconic stars of yesterday and today. Our Movie Stars' Homes tour continues to be one of our most popular outings. During your trip aboard our custom-built 13-passenger tour vans, you'll visit more than 40 celebrity homes, including some of the most famous and iconic stars of yesterday and today. You'll also get up-close-and-personal looks at the city's top sights and celebrity hotspots, including the legendary Sunset Strip and the Rodeo Drive shopping district in Beverly Hills, home of the world's most exclusive merchants and boutiques. Enjoy a photo opportunity at the Hollywood sign, find your favorite stars on the Hollywood Walk of Fame and explore the TCL Chinese Theatre, one of L.A.'s most celebrated movie premiere venues.